Just can't wait to get your hands on Shin Megami Tensei: Strange Journey Redux, the 3DS remake coming in 2018? Maybe this free game can help tide you over: say hello to Shin Megami Tensei Synchronicity Prologue (still a less confusing name than any non-numbered Kingdom Hearts game, btw). 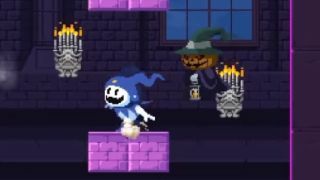 Shin Mega... y'know what, I'm just gonna call it Synchronicity Prologue from here out... stars the Atlus mascots Jack Frost and Pyro Jack as they travel through a 2D world inspired by Strange Journey. Together, they'll fight demons and explore the world by combining their powers of ice and fire. Kinda like Sonic Boom: Fire and Ice, except, y'know, about demons and not furry anthropomorphic animals. Fans are onboard with the concept, as one Twitter user wrote, "I would pay full price for a full-length follow-up to this game on Switch," with others jumping in to agree. I admit I'm not the biggest SMT series fan, but I like the concept of exploring its unique universe in a different way. And who knows, maybe if enough people download Synchronicity Prologue the idea could be expanded into a full-fledged offshoot of the main series. The trailer which announced the game called it a fake, but you can definitely download it right now from the Atlus website. A few caveats: the game is only available for Windows, text is written in Japanese, and it's only available until December 24. That said, if you're a fan of Atlus' demon-summoning, demon-fighting, demon-infested series all about demons, you could find quite a bit of fun here that won't cost you a dime.